Hello all! I am Mal from The Chic Geek, and am delighted tobe this week’s featuredblogger! Out of Madeline’s 3 Fs (food, fitness and family!) I decided that I wouldwrite a bit about fitness for my guest post (I write a whole lot about food onmy own blog, so this is a nice departure for me). I, like so many others have made a New Year’s resolution toget back into my fitness regimen. I am usually good about exercising everymorning, but at the end of 2011, my routine fell a bit by the wayside. I wentin search of new things to mix up my routine and not dread getting out of bedearly so I can exercise before work. This led me to discover the new trend of hooping! On a whim,I decided to order a travelhoop (which disassembles for easy storage or if you want to take it withyou) and level one of HoopnoticaHoop Dance. The DVD is slow and easy to follow and they teach you thebasics of waist hooping, hip hooping, how to do halos (hooping with your handsover your head) and other fancy tricks with your hoop. Be warned, there are alot of shots of one of the instructors hooping in a big open field which areabsolutely hilarious and will make you lose concentration momentarily! Once you have thebasics down, you don’t really need to watch the DVD anymore, I find myselfhooping and practicing the different moves while watching the morning news, orwhen I’m hanging out in the evenings, and I never really look at the clock as Ido when I’m on my stair stepper machine. You absolutely feel it in your abs thenext day! 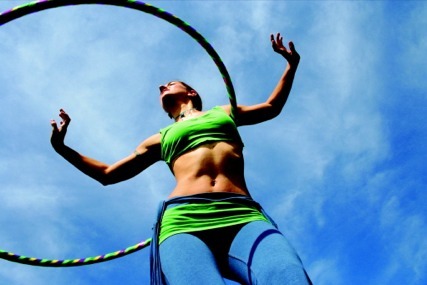 I have never tried using a hoop for a workout. Have you?